I’m a bit disappointed about this because I would have loved to see all of these rugged peaks reflected in the waters below a blue sky. However, I’m English and so am used to accepting that a mountain view is usually a bonus rather than a given. I also think that there can be a beauty in clouds and how they interact with mountains.Clouds hugged ridges and billowed around peaks, parting to open up new views and framing towers of rock. These clouds made the mountain views I had from Misurina were stunning. On each day of my trip I took a photo of one of the most stunning and photographed views in the Dolomites and these are the photos here. Even in cloud this view has something. 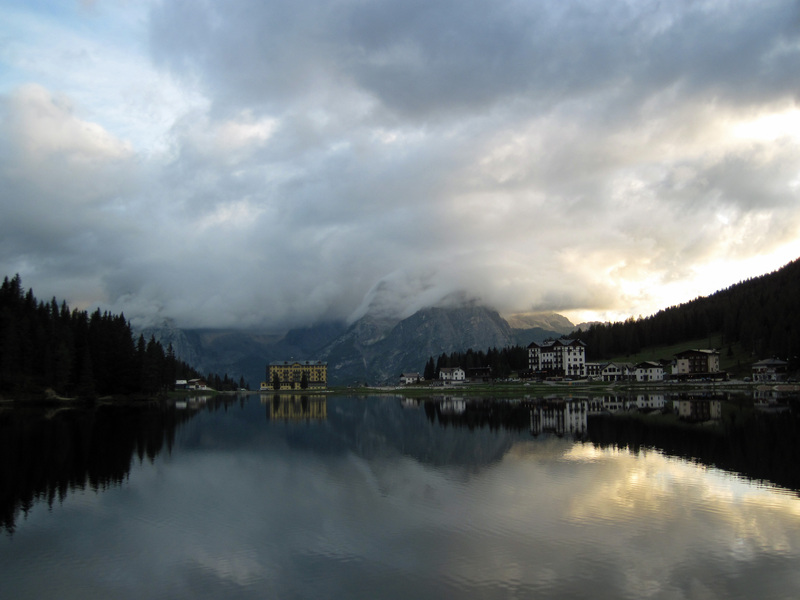 Misurina is just under 1,800m above sea level in the Dolomites of Northern Italy. It’s a small, quiet place, made up of a series of hotels and restaurants strung along a road that follows the shore of an amazing clear lake. 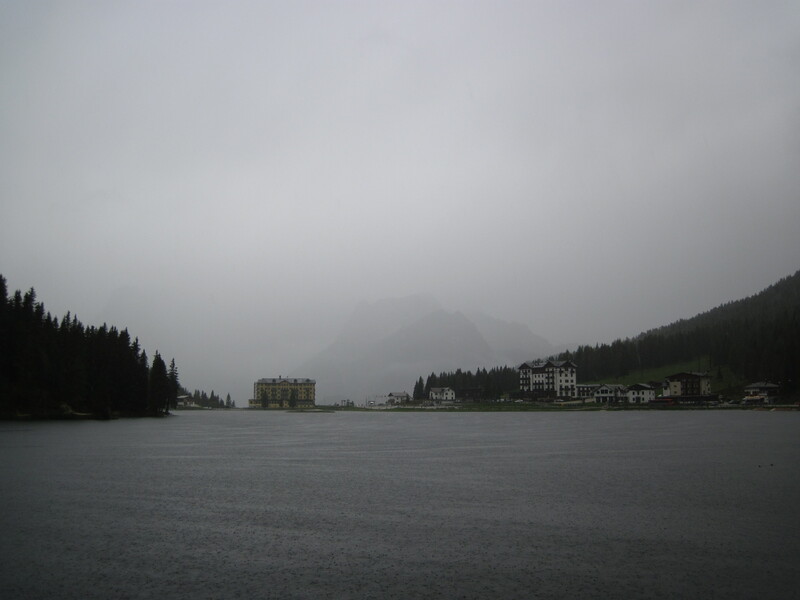 The lake is surrounded by pine forest and several mountain ranges. The air is deliciously clean and Misurina has a history as a place where people would come to heal respiratory conditions. Many of the nearby mountains were the scenes of fighting in World War 1. 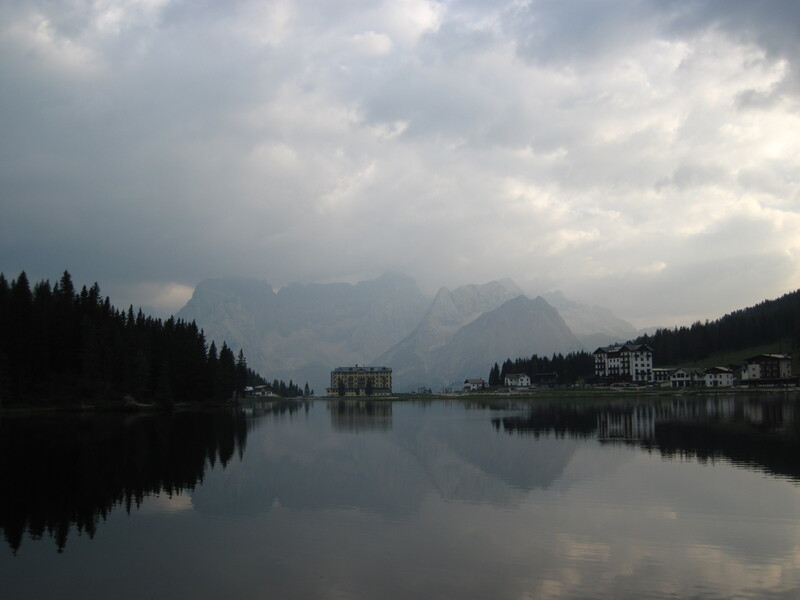 The open-air museum at Monte Piana and the old fortifications at Tre Cime are on the doorstep of Misurina. They are also the locations for several vie ferrate and Misurina makes a good base for exploring some interesting low to mid-grade routes. 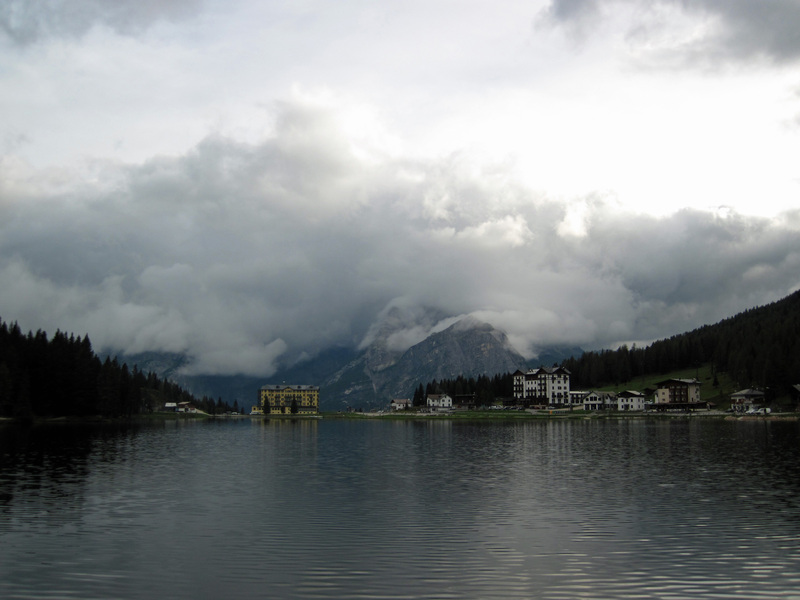 You can read a review of the campsite in Misurina by clicking here. If you want to see the view of the Sorapiss group without clouds, then you can find examples here, here and here. As always you write very well. Maybe you’ve missed your vocation. Thanks. That’s very sweet of you. Enjoyed this post particularly – and thank you for your photos; they give a much stronger sense of the place than the magazine-perfect ones…. With yours one can feel the rock under one’s boots! Thank you – I’m pleased that you liked the post. One day of magazine-perfect views might have been nice, but the views were still amazing. Mountaineering teaches one to be philosophical – does it not! And your take on clouds is one that I share! You have to be philosophical when you are waiting for the rain to stop. I went here last August and had an amazing time! The climbs were so good, and the views were spectacular! Love this post, makes me want to go back. I’m glad you liked the post. I’d love to go back myself.